Over the last couple weeks coworking and some of the coworking fascilities in North America have been featured in traditional media. And those of us with the ability to update this blog have been tardy in reporting this. The news did make the rounds of the Coworking Google Group, which anyone really interested in coworking should consider joining. It was previously reported that [email protected], the newest coworking space in Vancouver, was featured in the Vancouver Sun. However, Jane Hoges has written a lengthier piece where she visits four coworking spaces in four major US cities for the Wall Street Journal online edition. New Work City is again featured on the NPR website in an article by Kaomi Goetz. Finally on CNN.com is a story on Working in Wi-Fi Limbo which would have been improved with more information on coworking options available in most every major city. 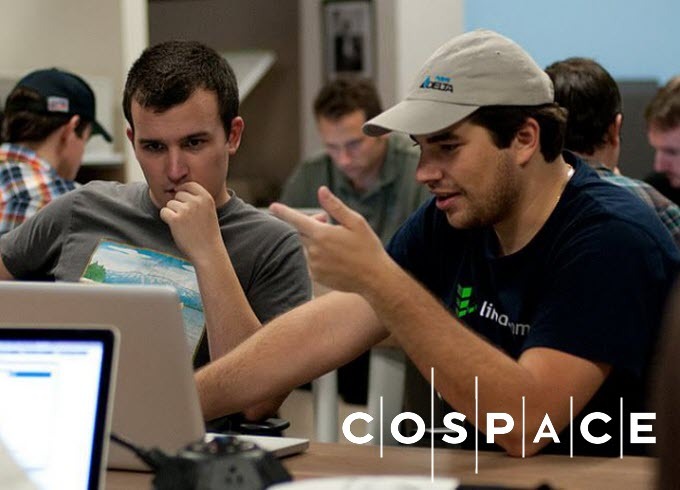 In related news i/o Ventures a tech start-up accelerator/incubator with elements of coworking, ie shared office space, combined with mentorship and capital investment, has opened in the Bay Area by one of the founders of MySpace and his partners. Organizations like this have popped up in Boulder Colorado, Seattle, and Vancouver BC. Their founders see them as a better way to bootstrap an organization and an alternative to traditional Angel and Venture Capital financing, especially in the seed stage. Finally for those that have read down this far is an excellent article articulating the Five Things Necessary for a Local Startup Ecosystem. I’m a bit late on posting this, but Austin coworking space Conjunctured was spotlighted recently on a segment on coworking on MSNBC. Don Teague did an awesome job putting this together, and we’re very grateful for the coverage. Check it out on MSNBC’s website. 200 sq. ft. for each employee – cubicle + hallway + breakroom + cafeteria + restroom + dead space like lobbies. Now a company that employs 1000 people, if they had just half of the space in corporate office and let their workforce telecommute 50% of the time they would save $262,500/month ($525 * 500 employees) and $3,150,000/year. $3 million per year is not small potatoes and a great way to cut back. The employee also saves money on gas But more importantly this employee benefits in intangibles such as lack of commute stress, living where his spouse needs to for her career, the community created in a coworking environment, and as a result is happier and more productive for his company. We would all benefit from more people using coworking spaces (checkout a list of my favorites). Of course, as the owner of Cubes&Crayons that’s my favorite for coworkers with and without kids. I love it when everyone wins! NPR’s Marketplace aired a short piece on Jelly and coworking on Monday, along with the above video. I’ve always liked the synergy and compatibility between Jelly as a gateway to full fledged coworking, and that this story blends the two initiatives speaks to fact that on ramps like Jellies and Juntos (in Philly) are great ways to coalesce the ingredients to coworking communities. Author Massimo CarraroPosted on May 13, 2008 March 14, 2016 Categories Coworking, Getting involved, Local efforts, Press, Spaces, Video4 Comments on It happens in Milano. 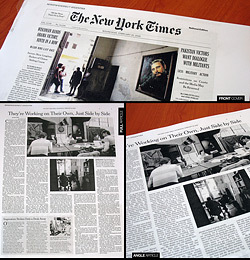 Yesterday, an article about coworking was published in printed version of The New York Times (written by Dan Fost). There have been a number of really good posts about coworking that should be mentioned here, even though they’ve all been adding to the Ma.gnolia Coworking Group. For some entrepreneurs, the idea of managing their own offices just doesn’t make sense. Sometimes, they’re consultants sick of working from the dining-room table or buying endless cups of coffee in a cafe. Sometimes they’re bigger startups or satellite offices that just don’t want to deal with buying furniture, setting up fax machines and hiring someone to man the front desk. 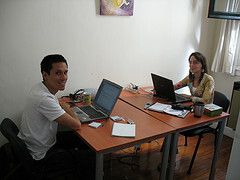 So another set of entrepreneurs has sprung up to meet these needs by providing shared office space. A diverse bunch, ranging from multi-state corporations with “plug and play” environments to small companies offering one large workspace, these businesses are growing in both San Francisco and the Peninsula. Coworkers of the World, Unite! in The American Prospect: The always-on, perpetual freelance culture of Web 2.0 has spawned its own “coworking” spaces, but are these new techno-optimists building sustainable communities? Resident plans shared space for creative work in The Daily Tar Heel: A solution is on the way for local freelance workers, startup-business owners and even students who need a place to call “office” without shelling out hefty rental fees. If you’ve got a quote or other good press for coworking, definitely share it with Ma.gnolia group and tag it with coworking!